Trying to buy back the R2K inverse shares I sold last week by Mon/Tue. Hoping to get trading shares around $17.20. We will see Mon/Tue. 3.5 day and 7 day trading cycles..... Limit order to buy in at 17.20 (if order hits I expect to trade out for 1.5% gain in 2 days or less). This is shorter term than my normal trade (but market is boring me). Update - May 20 close: Market played out as projected (chart green line). Missed low yesterday by 1 cent for trading entry. Missed a good part of run up this AM, finally pulled the trigger on RWM pullback around 11 AM at 17.41 and sold around 3 PM (see comment) as I said we should see a pullback last hour. Gain around 1 % after fees. Market should be up for almost 2 days (and RWM down)... So one could play IWM (opposite RWM) for a short term trade. Update May 22: RWM continues to follow projected path. Should bottom around 3 PM Thursday May 22. 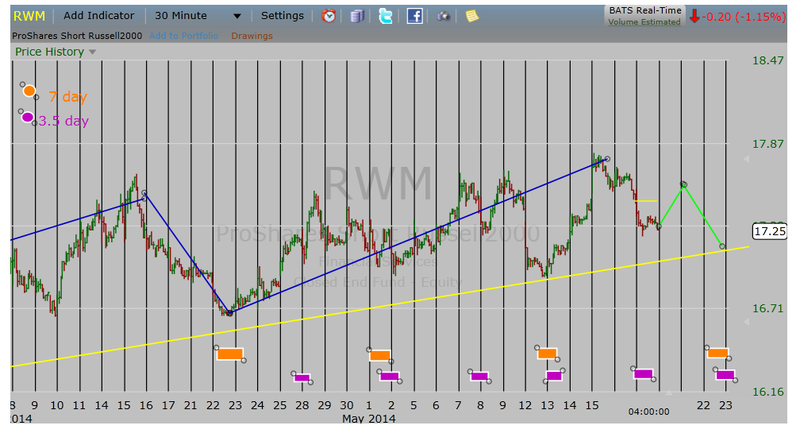 Update May 23: RWM bottomed around 3 PM Thursday as projected. If this is the bottom for 3.5 and 7 days RWM should be up Friday and into Tuesday afternoon. Since RWM is an inverse that means the major indices should be down Friday and into Tuesday. 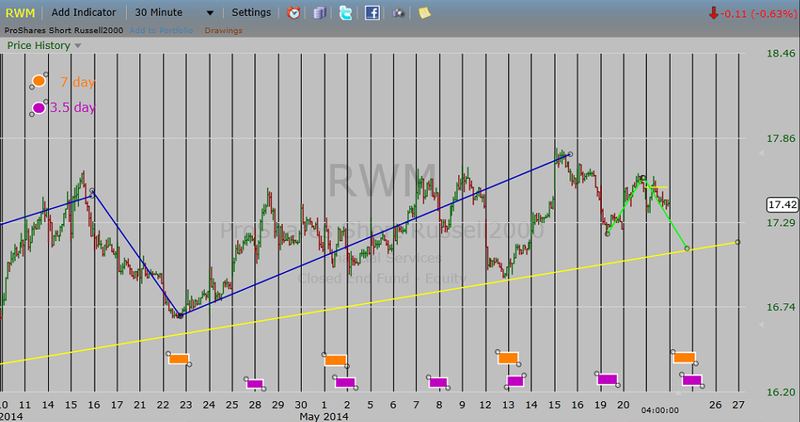 As expected RWM was up Tuesday AM (R2K and other indices down) - see 30 minute RWM chart with projections (green lines). If we get a pullback(market up - RWM down) I would expect that to be last hour. 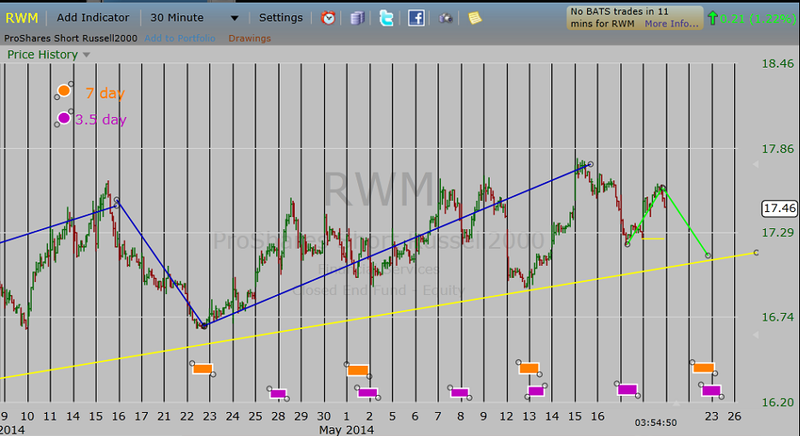 Missed low yesterday for entry RWM by a penny. Did not pull trigger at open (I should have), but bought on minor pull back around 11 AM. Grossed around 1.15% after I sold around 3 PM for a net of around 1% and got the expected fade last hour at 3 PM. See Update for expectations next 1 1/2-2 days. Appears RWM is following the down line projection fairly closely as it is set to make a 7 (and 3.5) day low near the close tomorrow (after 3 PM?). Since this is an inverse I would expect the R2K (and other indices) to be higher tomorrow. Had to raise bid to get shares near the close. Trading shares at 17.24. I expect over the next 2 trading days probably see $17.55 or higher for a sell. Looks like I stepped in it and bought early.